The design of your city or community influences your behavior. The greater the offer for climate-friendly practices, the easier it will be for you to design your own lifestyle accordingly.  The developed as part of the real laboratory "Urban Office" Climate Protection Card makes good examples and offers that support climate-friendly behavior in the city and surrounding area, visible and offers everyone the possibility to add new or missing in the map still missing offers and examples independently over OpenStreetMap. OpenStreetMap (OSM) is a free project that collects, structures and stores freely usable geodata in a database for use by everyone (open Data). This data is under a free license, the Open Database License. The core of the project is therefore an openly accessible database of all contributed geoinformation. Central part of the energy transition is the aliteration and addition of infrastructure, hence the required plants and mains for the supply with sustainable generated energy is available area-wide. This applies to both the power and heat supply, the aliteration is in most cases adopted by the local power supplier. By installing own generating plants (e.g. photovoltaics), connecting to a existing local/district heat network or the involvement in energy cooperatives, also you can do something to promote the expansion of renewable energies. Our feeding habit causes approximately 1.8 tons of CO2 per year annually. The major part of the emission origins from animal-derived food like meat, cheese or butter. Apart from that, the rest of consumption is responsible for approximately 4.4 tons of CO2 annually. This includes the purchase of new appliances and cars, just as clothing, shoes and toys. You can save CO2, if you use things as long as possible and consume less. 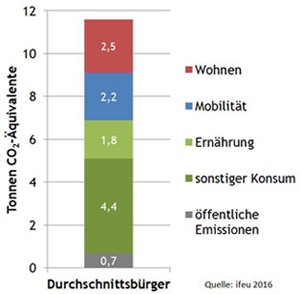 By the amount of ways a person travels in Germany annually, an average of 2.2 tons of CO2 per year are released. Air travel and daily car rides are responsible for the major part of this. The switch to environmentally-friendly means of transport can improve your personal carbon footprint significantly. For heating and domestic appliances, an average of 2.5 tons CO2 is caused annually per person. The major part is generated by heating, because of the mostly old and inadequately insulated buildings, the dominance of fossil fuels and the increasing living space per person. Organic farming is the most sustainable form of land management with a better energy and CO2 balance than conventional farming. The mineral nitrogen fertilizer, which is used in conventional agriculture, requires a lot of energy for production and is therefore associated with high CO2 emissions. In addition, the high fertilisation rate on the arable land in conventional cultivation leads to higher nitrogen surpluses, which lead to even more climate-damaging nitrous oxide emissions.